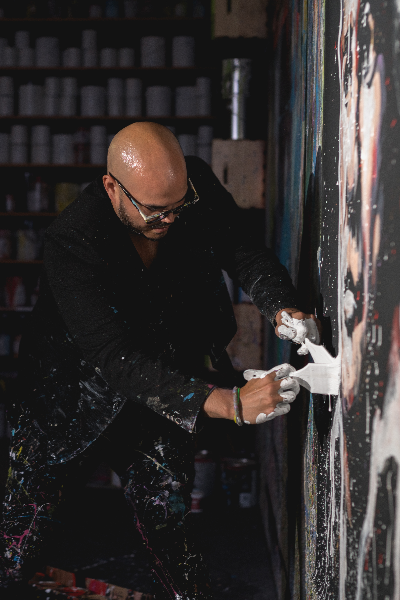 This November, get to know pop art icon and the unofficial ambassador of Sacramento, performance painter David Garibaldi. Photo courtesy of David Garibaldi. Rebel headquarters for Sacramento pop art icon, David Garibaldi, is right in the heart of R Street, across from WAL, the city’s epicenter of cool. While its exterior may scream “dark and mysterious,” the studio is as bright, vibrant, and meticulous as the artist himself. 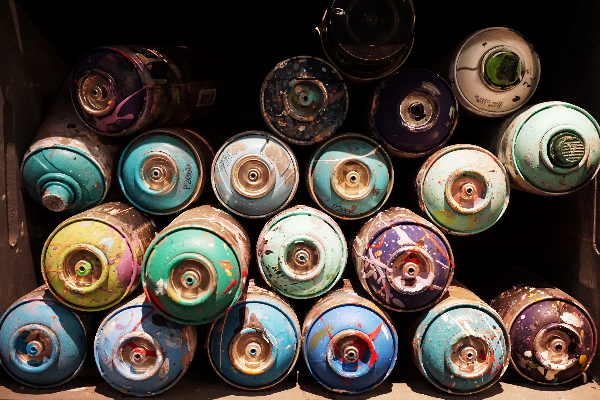 Neatly organized spray and paint cans and artworks border a well-lit-paint-splattered wall, center stage where all the magic happens. 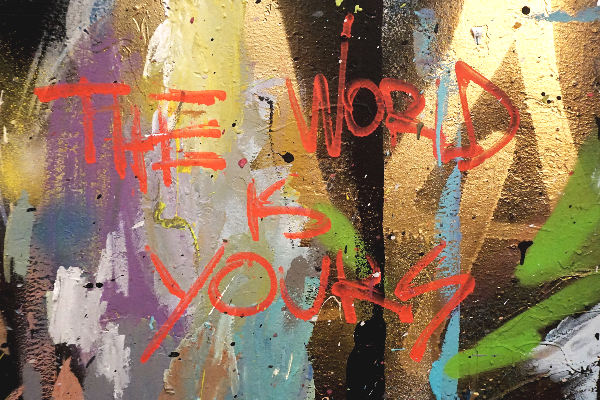 Mercury is just one of the many influential figures the artist has painted with his trademark Rhythm and Hue process. 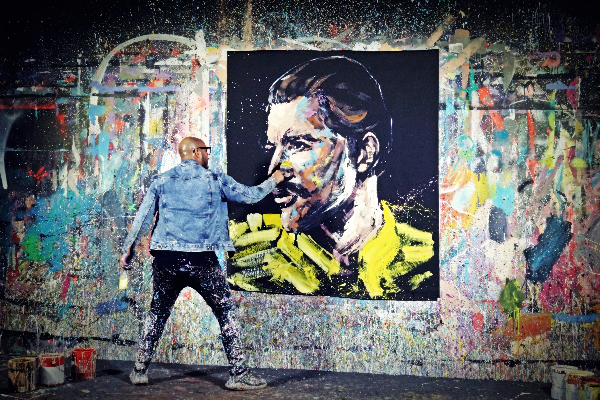 He’s made a name for himself across the region and throughout the world blending music and movement with paint. Dance, music, and art have always been constants in his life; but it was through performance painting where he brought all of his passions together. Let’s just say he bucks the starving artist narrative. But despite his rise to fame, Garibaldi doesn’t let success get to his head. Rubbing elbows with the rich and famous is just a perk and is not the ultimate end he seeks. Rather, he’s more interested in sharing his talents to help others. Photo by Roderick Cooney Photography. The phrase “passion and purpose” is mentioned constantly throughout the interview but without an ounce of insincerity. For Garibaldi, it is the guiding principle for all that he does. His first painting sold for $100, $200 below asking price; now his speed paintings sell for tens of thousands of dollars. At age 25, Garibaldi set a goal to raise $1M for charitable causes by age 30 (“I chose that number because it scared me”). He is well beyond that figure and is on his way to reach $5M. His new ambition is to multiply and inspire creatives through the nonprofit Creator X, a joint effort between himself and his junior year high school animation teacher, Shaun Sullivan. Although Garibaldi did not graduate high school (“I was very unfocused.”), lessons from Mr. Sullivan always stuck with him: “he taught me to look at art as something bigger, how to communicate intentions, and how to pitch them to others. These were concepts that are not typically discussed in a traditional art class,” recalls Garibaldi. Garibaldi and Sullivan kept in touch and sought pathways to bring arts education outside of the classroom. The two launched a Creator X summer camp, bringing 120 students to Sheldon High School to learn four art disciplines (visual, digital, storytelling, and performing arts). Each day also began and ended with inspiring keynote speakers. “It really felt like a TedX art camp,” remembers Garibaldi. “When I first got into ‘teacher mode,’ I was intimidated, but then I realized I was in a classroom full of young me’s. I knew I had to not only share information on figure drawing and painting but also teach the creative process and how art principles connect to real life,” says Garibaldi. And as thank-you letters from parents continue to roll in, it seems that Creator X is doing something right. In fact, Creator X is already prepping for its 2019 summer camp. Two days after Thanksgiving, the rebel with a cause will embark on another first, his Art Life Tour. After test-driving the concept last year at Ace of Spades, the artist heads out on a five-city tour starting November 24. Garibaldi and his team aim to make the creative process captivating and public through light, sight, and sound. 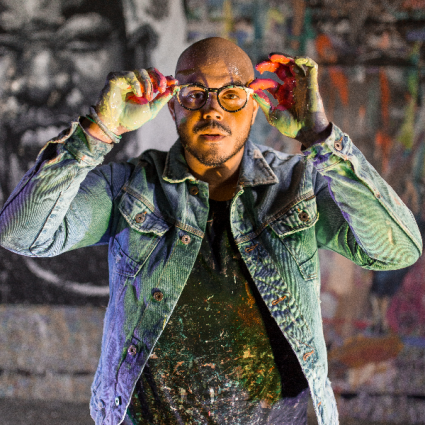 During his 70-minute set, he’ll paint eight portraits, ranging from movie icons to pop stars to patriotic and historical figures, all at a dizzying speed. His 12-person Sacramento-based crew features two dancers, a deejay, and live drummer Serge Lysack. Garibaldi also sets out to prove his naysayers wrong. (He and the art world have an interesting relationship, to put it mildly.) 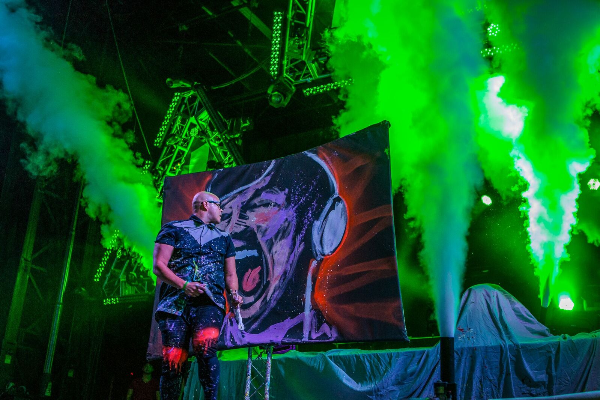 Art Life Tour is his first attempt to show that his brand of performance painting can be a viable form of arts entertainment. “I got into [art] ‘cuz there are no rules. I’m a creator…and I push boundaries. I’m all about creating…and not interested in doing something that’s acceptable,” says Garibaldi. 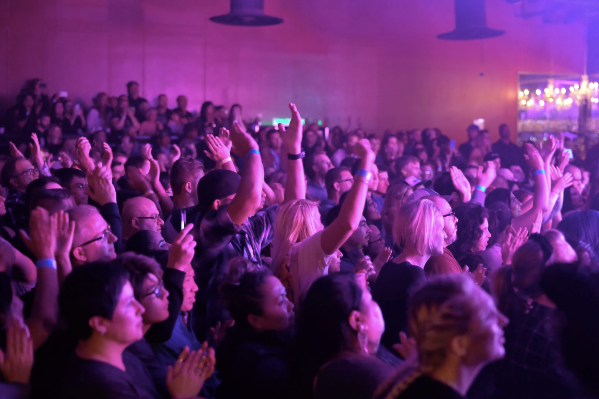 “If what brings you to the show is seeing live art, that’s great; but what you are going to experience is a level of inspiration you’ve never seen before,” says Garibaldi. Garibaldi once dreamed of becoming a backup dancer for Justin Timberlake. Competing on America’s Got Talent helped mold Garibaldi into a leader. “I had to wear different hats throughout the season. I had to encourage and empower my team…I had to reassure them that no matter how we placed, what we were doing was important and had never been done before,” recalls Garibaldi. When he’s not on the road, you might find the artist mastering his latest avocation, stand-up paddle boarding at Lake Natoma. Paint has another meaning for Garibaldi, specifically Passion, Action, Intent, New, and Teach. The artist and unofficial ambassador of Sacramento received his key to the City in November 2017. Foxy beginnings: Early in his career, Garibaldi beta-tested his performance painting-style at Fox and Goose’s jazz nights. Garibaldi’s ultimate dream gig? Performing with America’s royal family, Beyoncé and Jay Z. Get your daily dose of creativity and inspiration on Garibaldi’s active social media channels. Be a part of his inaugural Art Life Tour show at Ace of Spades on November 24. Purchase tickets here.